It is ski season now! All ski fields across Japan are all busy with ski and snowboarding lovers. You may have been to skiing once or twice during this season. Many people use cars or public transports, and stay at hotels or motels when they are out for skiing. But do you know there are better way to go there? That is a campervan! Campervans are not for just summertime. In fact, it is also super handy for winter camping with heating facilities that can be used inside of the car. Therefore, many skiers use rental campervans. This column will explain how to rental a campervan in Japan. You may often see cars pulling camping trailers outside Japan. However, in Japan, most people prefer campervans, typically compact size ones, to camping trailers no matter of self-owns or rentals. This is mainly because roads in Japan are rather narrow and Japanese ordinary houses are not big enough to spare parking spaces for large vehicles. Accordingly, Japanese rental campervan dealers also mostly have rather small sized campervans. Holders of Japanese ordinary driver licence are permitted to drive vehicles that meet the following conditions. Most of rental campervans fall into category 2, holders of Japanese driver licence or International Driving Permit can rent campervans in Japan most of the time. However, the campervan or comping trailer that you wish to hire exceeds 750kg, you are required to present a towing licence that is valid in Japan. *1 “Driver licence which is valid in Japan” includes: Japanese motorcycle licence, International Driving Permit issued in accordance with The 1949 Geneva Convention on Road Traffic (the original driver licence must be attached), or driver licence issued in Belgium, France, Germany, Switzerland, Principality of Monaco, Slovenia, Taiwan or Estonia accompanied with an official Japanese translation. However, some dealers accepts only Japanese licence. *2 Credit card must be under the name of the person who is renting the campervan. Same as ordinary rental car booking, a booking for rental campervan can be made as follows. There certainly are more demands for detailed information about specification and equipment of vehicles before renting a campervan. Most rental campervan dealers communicate with their customers only in Japanese, but some can respond in English. The following items may be available at rentals campervan shops. Availabilities of optional rental gears is different depending on each shop. If you require specific items, make sure to inquire the shop beforehand. Some shops offer rental plans that include some basic camping items. 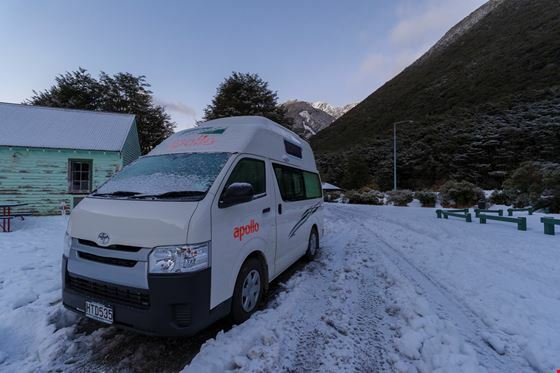 Now you know traveling in a campervan is not just summertime activity, but it may best in winter. Rental fares for campervans are more expensive than those of ordinary rental cars, of course. However, you don’t need to pay for accommodation if travelling in a campervan, therefore it can be cheaper in the end. Also, it is very handy as a private rest house with a nice warm heater when going out for skiing. If you are planning to traveling with friends or family, why not renting a campervan? Of course it is a very comfortable transportation in any other seasons.